Amb. Friis Arne Petersen began his work as the Ambassador of Denmark to Berlin in 2015. In 1978, Amb. Petersen graduated with an M.A. in Economics from the University of Copenhagen. 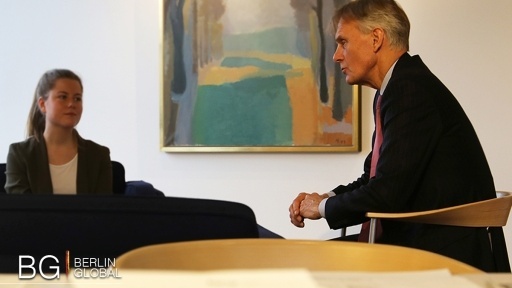 During the time between 1978 -1979 he worked as secretary, both in the National Audit Office and in Danish Foreign Affairs in economic department. Prior to his current appointment, Amb. Petersen served as Ambassador to the United States from 2005 to 2010 and to China from 2010 to 2015. Furthermore, he has served as Head of Section in both Economic and Political Affairs at the Foreign Ministry and became the 1st Secretary at the Royal Danish Embassy in Cairo in 1981-1984. Amb.Petersen has received the Commander Grand Cross from Egypt, Belgium, Brazil, Bulgaria, Germany, Finland, Japan, Jordan, Luxemburg, Romania, Thailand, and the UK. As the two nations share a land border, Denmark and Germany have had a long history of diplomatic, economic, and cultural exchange. Official relations can be said to have begun in 1732. Up until the German-Danish War of 1864, some parts of Germany belonged to the Danish kingdom. Nowadays, the bilateral relations can be traced to the Bonn-Copenhagen Declarations in 1955. In this declaration, the borders were mapped in their present place and the German minority in North Schleswig and the Danish minority in South Schleswig were promised the right to preserve their identity, rights and education in their own language. The present embassy building is a part of Nordic Embassies and it is located in Tiergarten, Berlin. Built in 1999, the Nordic Embassies is a unique example of collaboration between five countries in one city. In addition to the embassy in Berlin, Denmark has three General consulates in Flensburg, Hamburg, and Munich.